John Sodeau is writing on the Svbtle network. Kfm in Kildare phoned me the other day to talk about the warning notices that Irish Water had just issued many households with in the Dublin area regarding lead piping. It got me thinking because at the same time a potentially related environmental problem was unfolding at the Killarney Lakes where I was on holiday. In mid-August the public was warned not to drink from, fish or paddle in Lough Leane, which is the biggest of the Killarney lakes, after algal scum made up of blue-green cyanobacteria and other phytoplankton was observed there at a number of locations. The calm, warm weather conditions were suggested to be a reason for the problem but the root cause is most likely to be related to a build-up of phosphate nutrients from natural sources, detergents, farm effluent and sewage. They are, after all, the same reasons for the same problems seen there in the 1980s and the 1990s. So the release of phosphates into our environment is bad for us then? If so should all chemicals containing phosphorus be banned? At very least should we use types of fertilizer and pesticide that are not phosphate-based? Or are there any beneficial effects for using such materials and, if so, then do they outweigh any toxic outcomes? 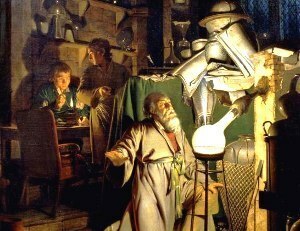 Those questions can all be answered but first a brief primer is needed about the element that is given the chemical symbol, P. This letter was not chosen because it was first prepared by boiling urine down to a solid residue in a method developed by the alchemist Hennig Brand in 1669. He noted that the product glowed with a pale-green light and waves of flames appeared to lick it’s surface. And so he named it cold fire. Later it was called Phosphorous after the Greek word “phos” meaning both fire and light. Phosphorus belongs to the same chemical family as nitrogen, which is the most abundant element in our atmosphere. In contrast there are no phosphorous-containing chemicals in the air whatsoever. In fact it is only ever found in solid phosphate mineral forms like apatite, which is often mined to make fertilizers. However both nitrogen and phosphorous are key components of important biological molecules such as DNA. They are also both essential for healthy plant growth with nitrogen being largely responsible for the growth of leaves and phosphorus for root growth and flower and fruit development. But being a good nutrient can be a double-edged sword for both protecting and attacking our environment. Obviously promoting growth of toxic phytoplankton in the Killarney Lakes frequented by tourists is not good. However in other circumstances the promotion of phytoplankton growth in water can be of benefit to us. One recent effect that has been discovered is related to phytoplankton helping to promote some global cooling. Oceans, with sufficient nutrients, like phosphate in them can lead to the production of algal “blooms” consisting of phytoplankton on their surfaces. Windy weather either in summer of winter conditions can then lift small bubbles containing the algal scum up into the air. Water vapour can then condense around them to form small droplets that are highly reflective to sunlight in the clouds that they help to form. In other words less warming can result from the sunlight because the radiation has been reflected into space and never reaches the surface of the planet. In fact the phytoplankton effect has recently been calculated to contribute about one tenth of the total reflectivity that clouds cause. In principle the finding could lead to part of a geo-engineering solution for reducing global warming if we fertilize the oceans on purpose with chemicals like phosphates. So the paradox of phosphorous is that it can be both a good guy and a bad guy in our environment. (Just like the important atmospheric gas called ozone that is good for us when it exists at about 25 km altitude where is protects us from harmful UV radiation but is toxic for us if it is released in the air that we breathe on Earth’s surface). However phosphates can potentially also be both good and bad for our water supply at the same time! Here’s why. Because of the extent of historical lead piping used to deliver water to our homes, Irish Water is proposing to add phosphoric acid, in conjunction with pH adjustment, at water treatment plants to produce a protective coating of lead phosphate on the surface of the pipes. The scaling effect causes a reduction in the solubility (and therefore reduces toxic bioavailability) of lead in the water supply. It says it will do so for Limerick City’s supply in September as a pilot scheme. It is intended to dose the phosphate into the water at levels of up to 1.5 milligrams per litre (parts per million or ppm) for a period of 6-12 months to develop a full coating. The dosing will then be maintained at 0.5 ppm to sustain the protective coating. This process is used in many countries like UK, Northern Ireland and Canada. But…..
…..in the USA the recommended level of total phosphorus in estuaries and coastal ecosystems to avoid algal blooms is 0.01 to 0.1 ppm of phosphate. So will there potentially be a phytoplankton problem in our water supplies as the result of adding phosphoric acid to our water supply? Over to you Irish Water.